Come join us in room 1223 in the Forestry and Wildlife Sciences Building tomorrow at 3:30pm to learn more about lemur conservation. On Nov 6th from 7-9pm we will also have Lemur Trivia night at Niffer’s Place! If you can’t make it to trivia, try to grab a meal there, because they will donate 10% from purchases all day to lemur conservation through the Mad Dog Initiative! 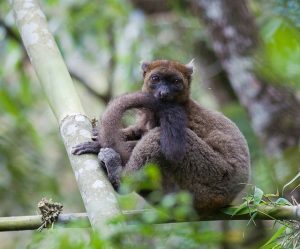 Click here to read about our research linking climate change to the critical endangerment of the greater bamboo lemur. Stay tuned for our World Lemur Week schedule! 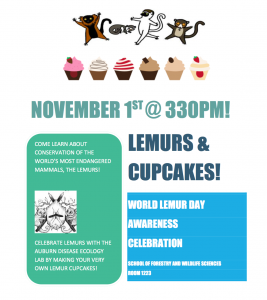 Stop by to get a lab sticker and lemur cupcake!